Rewind back to 1990, as a nine-year-old my parents took me and my sister to Walt Disney World for the first time. I was in awe of everything I saw and I was hooked. Many trips followed since that 1990 trip including 1998 Eastlake North High Marching Band competition, in which we won many awards. Fast forward multiple trips to Disney to the year 2013 and again my parents decided to take the family to Disney. 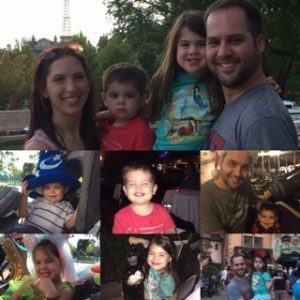 My sister and I each have families of our own and were able to re-experience Disney through the eyes of our kids. How awesome! During this trip, my wife looked at me and told me she wanted to go back with just our family one time, I knew she was hooked. I planned a trip, detailed every day and every event to the tee. I did all my research to find the best room with the best view, find the times when crowds were lowest and picked all the character restaurants I could. The trip was great. I had learned a new aspect of Disney, planning our trip, and it was fun. My wife stopped me one day when we were in the parks and told me that this was the best trip she had ever been on.